Reprinted with permission from Gems Sensors & Controls white paper. Efficient operation of industrial HVAC and chiller equipment depends upon optimum temperatures of refrigerant and lubricating oil at various phases of the refrigeration cycle. The most common sensors for this purpose utilize negative temperature coefficient (NTC) thermistors of various resistance values. NTC sensor devices exhibit lower electrical resistance when exposed to higher temperatures. Either thermistor or RTD-type sensors may be used for this purpose, however thermistors are preferred for most applications due to cost and media exposure attributes. RTDs are more expensive, and the fragility of the sensing element require it to be separated from the sensed media within an enclosure. Thermistors are more durable, and may be immersed directly in any non-conductive fluid media being sensed, for quicker response to temperature changes. There is an inherent non- linearity in thermistor output that requires temperature and resistance correction for the output. Manufacturers of thermistors, and sensors made from them, can provide Resistance-to-Temperature curves for this purpose. Assuming equivalent thermistor quality and resistance values, combining the thermistor within a housing that can be installed into HVAC or chiller equipment is what differentiates one sensor assembly from another. These fall into two basic types: exposed or enclosed thermistor housings. Exposed thermistors directly contact the fluid being sensed; in this application, those are refrigerant, oil, and oil/refrigerant emulsion, although they may be used in any non-conductive fluid. Direct contact with fluids provides faster and more accurate thermistor response. The downside to exposed thermistor sensors is leakage through the housing where the thermistor leads pass through sensor housings, especially in pressured installations. Leakage results in maintenance downtime for the operator and warranty issues for the equipment manufacturer. Enclosed thermistors encase the thermistor inside a probe that is an integral part of the housing. These eliminate the leakage issue, but because the thermistor is actually in an air pocket surrounded by the metal or plastic housing, temperature compensation and sensor responsiveness issues are introduced. Gems Sensors & Controls has produced a third type of housing that combines the performance of an exposed thermistor design, while providing the hermetic sealing of an enclosed sensor housing. 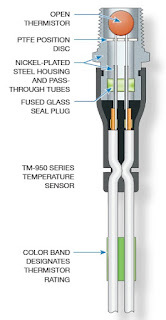 Known as the TM-950 Series, these thermistor-based temperature sensors were designed specifically to solve long-term reliability issues in HVAC and Chiller applications. TM-950 Series temperature sensor incorporates a unique fused-glass technique to produce a hermetically sealed the housing. Molten glass is placed inside the heated housing. As the assembly cools the metal housing shrinks, compressing the glass. In addition, the boundary surface of heated metal and glass bond at a molecular level. Two nickel-plated steel tubes are positioned pre-positioned before the glass fusing process to provide a pass through for the thermistor leads. Any of a variety of thermistors may be utilized based on the temperature sensing profile required. Once leads are passed through the steel tubes and glass, induction soldering fills the tubes completely, providing a leak-proof seal to 450 psig. The result is a sensor with the benefits of direct fluid contact incorporating the leak-proof attributes of an enclosed sensor.